In the mornings, I am busy, normally moving from one thing to the next. I normally try and take some me time but also make sure my breakfast is jam-packed with goodness. my morning smoothie will always have protein and collagen powder in it but greens? No way! I couldn't do it! That was until I started using Greenade. My 'Hannah's Greenade Kickass Smoothie" Includes Greenade and the combination makes it a super powerful kickass start to anyone's day. Greenade is all about giving you energy in a positive natural way and I love it. Greenade is an all natural green juice (mostly organic too), which for once doesn’t taste like green dirt. The founders, Michael White and Patrick Cadei, were on a mission when it came to this one and I thank them for that! I have had two green powders by different brands in the past, all loaded with goodies but they didn't taste great, so what happened? I stopped using the product meaning I wasn't getting the benefits and effectively wasted money. A super powerful combination to give you an energy post, help with focus and provide so much goodness! I know I personally try and drink Amino Acids during the day to help with my muscle repair and growth but always forget so having Greenade in the mornings in my smoothie is another job done! The one thing that struck me most about Greenade was their support - After doing continuous research, they have actually found that most products in the health industry don’t offer full-time support. 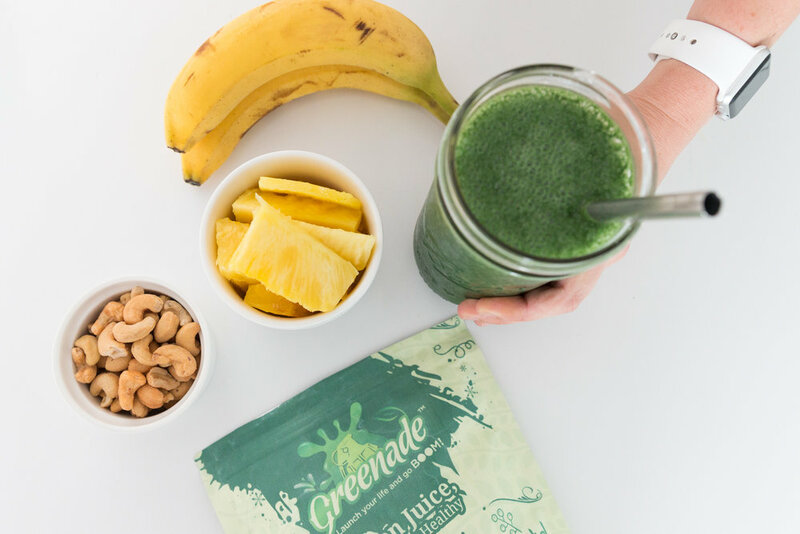 With Greenade they wanted to go a step further - and have a membership area for customers where they can: Chat with our nutritionists and ask whatever they want, get customized nutrition plans and post workout plans, as well as access to so many nutrition education pieces and recipes. There are a lot of companies out there but I really do like Greenade's approach to business. The team at Greenade not only offer a great product, but they also provide full-time support alongside the juice. Use the following code GREENHANNAH to get 2 FREE sessions with their nutritionist's team, support, recipes, education and more. Okay so I have raved about Greenade! It is one of those products that can be drunk alone, with just water or can be mixed into a smoothie or juice. I've made a "Kickass Smoothie" and I wanted to share it with you. This Green Smoothie features all the ingredients to kickstart your day strong. Blend together all the ingredients with water and you are good to go. If you want to mix it up add lemon juice, lime juice or spinach leaves.